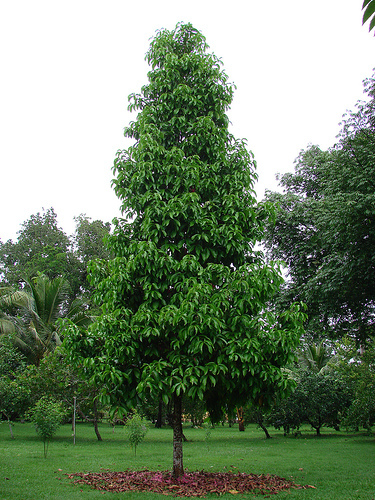 Diaspyros samoensis, "Samoan ebony" (Ebenaceae). Probably from a combination of > PROTO-POLYNESIAN *kau "tree", from PROTO MALAYO-POLYNESIAN *kayu "tree, wood, timber" through PROTO OCEANIC *kayu "tree or shrub, wood, stick" and PROTO-POLYNESIAN *quli "black"
The initial element in this word (kau-, ultimately derived from Proto Malayo-Polynesian *kayu) also occurs in two other tree names - kauere (=Puriri, Vitex lucens) and kawariki (Coprosma grandifolia). "Kauli" seems to have been a generic descriptive name which came to be applied to a particular species with those features (rather like "blackwood" in English). Since it would have started its voyage in Samoa, we have given the Samoan meaning as the gloss for the ancestral word. In Tahitian the local form of the word is applied to the saplings of the breadfruit (uru - Artocarpus communis), the Tahitian apple (Spondias dulcis - vī), the Tahitian chestnut (Inocarpus fagifer - mape), and Malay apple (Syzygium malaccense - ahia), all economically important trees, as is the kauri (Agathis australis [Araucariaceae])in Aotearoa. There is a picture of the ebony kauli above - borrowed from the National Botanical Garden in American Samoa, via a German website. The fruits are vaguely reminiscent of (New Zealand) kauri cones, and it may welll be this feature and the strength and importance of the timber that inspired the transfer of the name. 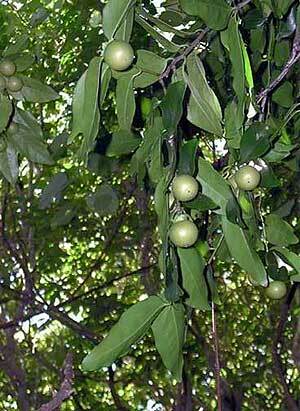 (In parts of the Pacific the fruits and leaves are used to concoct a fish poison.) Although very different in size, breadfruit (the fruit of Artocarpus communis [Moraceae] ) are also similarly shaped. Young vī (Spondias dulcis [Anacardiaceae]) may look vaguely like young kauri, if the texture of the leaf is ignored; and the slim straight trunk of the kauri might also have reminded early settlers of the mape (Inocarpus fagifer [Fabaceae]) -- the mixed connotations the word developed in Tahiti are relevant to Aotearoa, because the change or expansion of referents would have been in progress, even if not complete, when contact between Tahiti and Aotearoa was established and then lost. 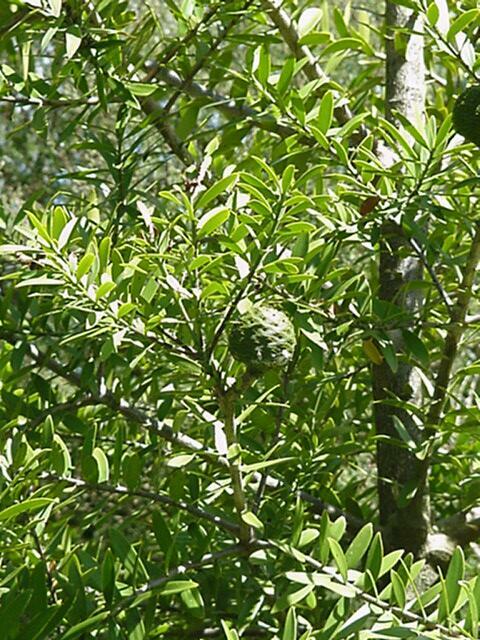 In this respect, the NZ kauri has a shape highly reminiscent of the Malay apple (Syzygium malaccense [Myrtaceae] ) - see the photograph below. Otherwise the trees are completely different -- you cannot eat the kauri cones, but there are some good recipes for Malay apples, a widely distributed tropical fruit on the net, including one of the sites where this photograph was featured. Kauri with cones, Te Māra Reo. Sources: Pollex; Proto Polynesian Lexicon, Volume 3; Ilocano Dictionary (Rubino); Pangasinan Dictionary (Benton). (See Bibliography for details). Photographs: (See acknowledgements above.) 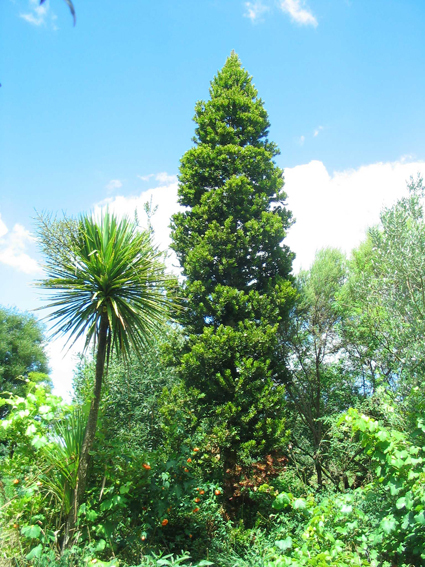 There are other photographs and links on the page devoted to the Maori word kauri and the tree of that name. The book New Zealand's Native Trees by John Dawson & Rob Lucas (Nelson: Craig Potton, 2011) has some magnificent photographs of kauri along with many other NZ native trees.